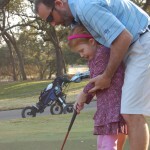 The My Little Golfers seed started over 36+ months ago with a deep passion to share the joy I experienced when introducing the game of golf to my children… my hope – to “bottle up the joy” and create recipes that other parents could use with their own children. This experience has been one of the most rewarding journeys (and unexpected) in both my professional and parenting life. 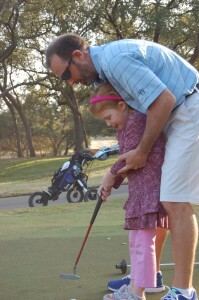 In an effort to expand the impact of the MLG vision, I sought out to expand the MLG to the golf course with kids that have never played (ages 3-5) and parents that were interested in being actively engaged in the process. In some sense, we create a MLG petri dish to apply different theories on teaching the game to children in a fun and engaging manner. 2. Play – it was not all golf, we made sure to “listen” to the attention span of the child and ensure they played in the sand trap or took a break to eat some goldfish. 3. 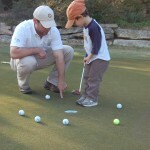 Core Values – teaching the “code of golf” to a child is important so they will respect the game. 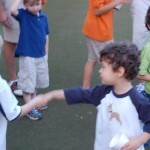 Small things like shaking hands with the other children and telling the parents thank you. Based on feedback from the parents, 100% of the kids gave their inaugural golfing experience a 2-thumbs up and were excited to continue learning the game. 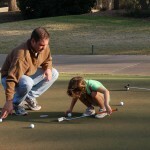 Ironically, many of the parents started to experience some of that joy in seeing their child play the game. 1. Find a couple of other children (and parents). 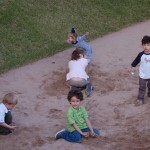 In my opinion, the group environment doubles the “fun factor” for a child… this is why many of them opt for organized sports. 2. Keep it simple. Don’t overdo it. 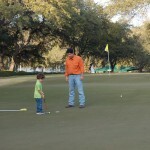 Just have a “golf play date” 2X a month with a couple other parents. 3. Engage your Pro/PGA professional. They have a vested interest in your child’s success and they will help you. 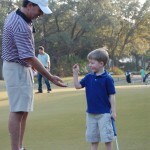 These pictures summed up the experience – an overwhelming success and the beginning of a new relationship with both children and their parents but also the “planting of the golf seed” with these future golfers. My Little Golfers planted its first seed… and hopefully these children will be future players for the rest of their lives.